J. Paul Barnett Interview with Bruce Duffie . . . . . When we think of the 4th of July, we immediately envision flags waving in the wind, parades and gala concerts ending with the 1812 Overture and a wonderful fireworks display. It’s impossible to separate the festivities from the date, and it would seem almost incongruous to play the Tchaikowsky work any other time... though it does get programmed on Pops Concerts occasionally and even in subscription series by the great orchestras. No matter what, though, the music evokes a certain patriotic grandeur, and part of that is due to the cannon shots which happen near the end of the piece. And like trying to keep the Lone Ranger out of our heads during the William Tell Overture, it's impossible to refrain from conguring Calvin and Hobbes during the 1812. Why? It’s those cannons at the end, of course! Real cannons in the concert hall! Well, at least at outdoor venues, anyway. At those gala events, we expect artillery, and J. Paul Barnett is the one who provides not only the shots, but sees to it that they are fired accurately, just as the composer demands in the score. For more information about Barnett and his company, click this link. Living in Chicago all my life, I admit to being spoiled by the Chicago Symphony and all the other great musical groups who are here. But little did I know that in South Bend, Indiana. which is almost suburban Chicagoland, really, Barnett is busy making replicas of guns and other metal pieces. For many years, he’s been called on to bring his re-creations and expertise to various festivals so that the familiar music will have the proper emphatic booms. After learning of his work, I finally persuaded him to visit the WNIB studios for a chat, and here is what was said at that time . . . . .
Bruce Duffie: I assume that you genuinely like the 1812 Overture? Paul Barnett: Sure. It’s an interesting piece of music. There’s a history in the Overture, and then the history of the overture itself. There’s a lot there to enjoy in both of them. BD: When you heard it as a child, did you think, “Oh, it would be good if it had cannons in it”? BD: When did you come to building cannons yourself? PB: It was a hobby that grew up some years ago. In youth I was a State Trooper for a while, and a high school English teacher for a while. I had become involved with the muzzle-loading sports and this then grew into that. Some years ago I got involved in a project that wound up being a small book on Lyle guns which were developed in 1878 for projecting lifelines to distressed ships. BD: So these are not guns that are used to destroy things. They’re actually guns that are used to save people? PB: Correct. They were used world-wide for lifesaving. BD: Were you building these as authentic pieces, or as replicas? PB: We had made some Lyle gun replicas and reproductions that are used in restored lifesaving stations in their Living History Programs. But the ones we used in the Overture are originals. BD: When did these come together — the building of the guns and the putting them into the 1812 Overture? PB: In 1967. I got a call from Erich Kunzel in Cincinnati, and he said they were going to do the 1812 Overture in a stadium there, and asked if this would be possible. I said I thought so, and we went down there and muddled through a performance. We got all the shots inside the music, which was an accomplishment at that time! BD: But they weren’t in the right place? PB: They were close! They were close as we could get. The orchestra didn’t know what to expect from us and we didn’t know what to expect from the orchestra. After the first year I got a chance to go to the library and do some reading, and found out what Tchaikovsky intended! BD: Did it surprise you that Tchaikovsky actually wanted specific cannons at specific places in the score? PB: It did, yeah. In 1880, when he wrote the piece, his intention was to use electric ignition in the interest of precision. The guns were to be fired from the conductor’s podium. BD: Then for nearly a century it was just been a big guy on a big bass drum with a big mallet? PB: Oh, I don’t know what they did. There are all the stories about shotguns being fired over oil drums and things like that. There are stories of downtown glass taken out and all sorts of things! And some unfortunate things, too. BD: That’s right, because of indoor performances, rather than outdoor! PB: Right! In the concert hall they used shotguns over oil drums and pistol shots and all sorts of things like that. But to be done authentically it pretty much has to be done outdoors. BD: Do you think of yourself as part of the “authentic instrument” movement, then? PB: In that sense, yes. The first five shots are on four, three, two, one and one, and that’s where we put them. And we have to take the time lag into account. BD: I see, so you think about where the guns are and make sure that the sound of the guns will be at the right time? PB: The sound must get to the audience at the same time the sound from the orchestra gets to the audience. Sometimes it’s in a triangle situation, so there’s a lot of human judgment involved. BD: You have to be an acoustician, then, also? BD: Do test shots have to be made at each location, because of the difference in the ricochet time and echo time and the distance between the cannons and the orchestra? PB: We’ve fired test shots every place we have worked, even at places where we have been for twenty years, just to make sure everything is right. We’ve shot the same load at Wolf Trap since 1979, with the exception of one show where we dropped it one ounce and then went back up. PB: Atmospheric conditions and all sorts of other things may affect it. Actually, we seem to get the best shots in a fog. PB: I suppose the lay interpretation would be that the air is heavy, as opposed to being fluffy as it would be in the middle of a desert. But we do test shots every place, and usually the load stays the same from one year to the next in the same place. BD: Is each installation unique? BD: Is it a purely sound idea, or do you think about the flash and the visual? PB: There is a tremendous visual effect, and this is something you don’t think about when you hear any of the recordings that have been made across the years. There’s a terrific flash that comes out of each gun. It’s very much part of the show, and there would have been in 1880, too, when he wrote it. There would have been a beautiful visual effect to it if it had been done, but it wasn’t done. BD: So Tchaikovsky never got to hear the cannons? PB: Apparently not. He wrote it in 1880 and it was to be performed in 1881. Part of it involved the twenty-fifth anniversary of the coronation of Tsar Alexander the Second. It was to have been performed, I believe, in September, but the Tsar was assassinated in the spring and that kind of let the air out of the program. It was to have been done in the square before the Cathedral of the Redeemer, which Tsar Alexander had commissioned to commemorate the Battle of Borodino, but the cathedral wasn’t finished until 1883. And according to what I have been told repeatedly across the years, the Overture was first performed in 1882 indoors at the Moscow Arts and Industry Exposition with conventional orchestration. And I’m told that Tchaikovsky was under pressure to do it in various other venues, but it was done without the cannons. BD: Do you know when the first use of the cannons, or any kind of live ammunition was given? BD: They just re-wrote the ending! PB: Of course, they don’t do that now! They’re playing the Overture as written again. In downtown Leningrad in 1990, we had the pleasure of working with the Leningrad Philharmonic. BD: Is it special to you that that was put on record so that your performance is everywhere? PB: Oh, boy! That was just a marvelous experience! They flew the guns to Russia and we were able to get the supplies we needed to Leningrad. We were there having pleasant conversations with the military and police, and presumably the KGB and everybody else! I’m told that people were backed up in Arts Park for some distance. There was a Russian music school that let its students out to come down and see the 1812 Overture. BD: Did they take your equipment or your ideas and manufacture different or similar kinds of things to use there now, forever? PB: To my knowledge, no. BD: Have you licensed this to anyone else? PB: [Laughs] No, no. I don’t think there could be any licensing involved. Our only claim to uniqueness is that we’ve been doing it for a long time. BD: Now does it disappoint you if you hear about, or see on television, a performance where the cannons are not accurate, or the cannons are not what you expect? PB: You have to feel something about that, sure. I suppose if I were a trombonist, I would watch the trombone section very carefully! BD: Does it please you, though, that people are at least trying to get things right now that they’ve heard it accurately through your efforts? PB: Yes, sure it does. With the old Dorati recording, for instance, it was so important that on one side they had the Overture, and on the other side they had an explanation of how it was done. BD: I remember that LP. PB: They took a gun at West Point, shot it and recorded the shot; then in the lab they dubbed the shot in sixteen times. BD: At the right places? PB: At the right places, yeah. It’s going a step further to do it with an electric switch box, as Tchaikovsky intended in 1880. Of course, he was probably dealing with big knife switches at the conductor’s podium, and we’re dealing with nice little toggle switches! They are much less cumbersome. BD: Do you envision a time when your mechanism would just be put within the percussion section, and the third percussionist would be the cannon-firer? PB: No, because he couldn’t handle the time lag. The shots have to go through one mind sitting at the switch box, watching and listening to the guns and listening to the orchestra. BD: So actually you’re listening more than watching the conductor? PB: I can’t even see the conductor. My back is to the conductor usually. I’m watching the guns; I’ve got my hands full there with the guns and the switch box, and keeping the guns synchronized with the orchestra. It might be a little hyperbolic to say I guess I’m thinking in milliseconds. BD: But you do have to adjust your pushing the toggles to compensate for the time lag. PB: Exactly, yeah. Judging from the sound of a camera shutter, for instance, I would guess at Wolf Trap we’re shooting a sixteenth of a second ahead of time. BD: What’s the longest time lag you’ve had? Or is that the longest? PB: I don’t know that there have been any longer ones than that. At Ravinia, where we work every year, it’s almost simultaneous because the guns are close in; it’s close in sight. Wolf Trap is very expansive. BD: I was going to ask if there’s ever a time where you actually push it and hear it. PB: I think Ravinia’s closest on that. BD: Now that you’ve got the 1812 Overture down and it’s a part of you and a part of the American (and probably the world’s) psyche, would you want to work with another composer to write a piece that includes cannon? PB: That’s come up across the years and I don’t know. I can’t imagine it happening, but if it did, it would be interesting to see what would come of it. I wouldn’t expect much to come of it. 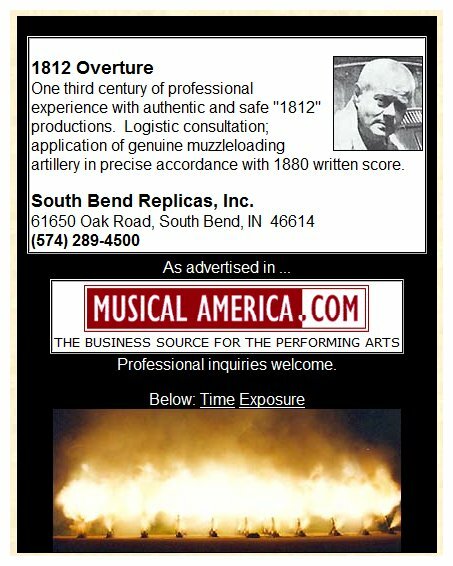 Once you have done the 1812 Overture, that’s a hard act to follow with something else. Perhaps Wellington’s Victory. BD: But maybe for another program. Or at the end of the first half, have the “other” piece, and then for the end of the second half, reload the cannons for the 1812. PB: I don’t know. For one thing, there’s a recycling time involved. The preparations across the afternoon take hours. BD: So once you’re set up, you couldn’t reuse the cannons twenty minutes later? PB: It would be difficult. PB: Yeah, it’s a possibility. As a matter of fact, there’s been a program suggested for next summer that would involve using some additional equipment and then recycling the equipment. It’s not a musical event; it’s something else. It’s on the “let’s-look-at-the-possibilities” shelf right now. BD: I hope it works out. PB: I don’t know if it’s going to materialize. If it looks like it’s going to happen, then we would move into gear and see how to accomplish it, if it can be accomplished. I think it could. BD: You’ve always worked these with the small cannons? BD: Could you do this with larger bore, or smaller bore instruments also? PB: We could, sure. The problem is logistics. Lyle guns were built to be portable, and we can get sixteen of them into a one-ton pickup truck and trailer. With full-size field guns or something along that order, you would have to have semi-trailer-level equipment to move them, and that would be prohibitive in getting to some of the sites. The cost logistics would be too much. BD: I’m thinking maybe of smaller bores, like a standard gauge rifle, or maybe even a Gatling gun. PB: [Laughs] Small ones for a set of miniatures? Yeah, no. You don’t get the sound that’s necessary to correspond with the orchestra. BD: But maybe a different piece of music, or for an indoor performance using your mechanism and your control. PB: Not with anything that shoots. For one thing, it would have to be a black powder instrument, and the smoke out of black powder is just legendary. You would have to have a fire marshal that was liberal to the point of lunacy to allow that in the building! [Laughs] But outdoors it works fine. Lyle guns have a two and a half inch bore, which is a bore consistent with the bore of a small field gun. And you get a good, deep-throated cannon sound out of it, with the smoke and fire on each shot. BD: And that’s what you want. You want the sound and the smoke and the fire! PB: The sound, and the smoke, and fire. It works that way. When Tchaikovsky envisioned doing that in 1880, that would have been a Star Wars sort of thing. A lot of people wonder about electricity in 1880, but street lights and telephones were being installed, and the telegraph was operational in 1843. Telegraphy was common in the Civil War. The USS Cairo at Vicksburg was sunk by an electrically detonated torpedo in the river. So Tchaikovsky was using the technology that was available to him, and he probably had some very good technical advice from the army or an electrician, or someone. BD: Is it easier or harder for you to coordinate your material with a fireworks show afterwards, as often happens? PB: After the show, fireworks are great. If the fireworks are done during the overture, I would guess they would hire a musician, maybe a keyboardist, and have him go plinkety, plinkety, plinkety at one end of the piano! But we have a wonderful time working. Most of the pyrotechnicians that are hired for those things are very professional guys. BD: I assume their kind of firing mechanism is similar to what you use? PB: Some do. I’ve seen some of their equipment and it can get very sophisticated. They’re into computerized things and all that. I hearken back to the old Model T Ford ways — one switch, one shot. It has to be that way because of the time lag. BD: You never envision it getting to be more computerized? PB: No, not any more than you could computerize a musical instrument into the orchestra as the conductor conducts from one time to the next, or as one conductor conducts and then another conductor conducts. BD: Have any conductors objected to what you’re doing? BD: They all like it? PB: Well, some conductors aren’t that concerned about the Overture. But some really, really appreciate it and want to go out and see the guns, see the equipment and take a historical interest in it. Those, of course, are the ones that are the most fun to work with. BD: I’m trying to think of anything else that needs a cannon. There’s a cannon shot in Tosca which signals the escape of the prisoner from the jail. PB: I guess there are some in Victory at Sea, too. That would be a long program to sit through for whatever shot’s at the end! BD: That’s right. The cannon shot in Tosca is in the first act, so you could come in, set it up, and go home! I’m trying to get you more work! I’m trying to get you into more different pieces of music. We’re going to have to get something to be written. PB: Have somebody do it and I’ll certainly be happy to take a look at it and see if something can come to fruition. BD: Would you want to be coordinating with the composition of it, or just see it when it is finished? PB: No, that wouldn’t be my part of the work. BD: So now the rest of the time you spend making and building the replicas? PB: Yeah. We do a lot of work for ship and port restorations, and museums and things of that sort. BD: So you really are part of the original instrument movement? PB: I suppose, yeah! We did some work this spring for the USS Constellation and the Delaware state flagship, Calmar Nickel. We also did the guns on the Pride of Baltimore and we’ve done work for movie studios. BD: I was going to ask about effects for movies, or if the studios take care of that themselves. PB: Usually, but it can be anything. If it’s going to be a thing like Glory or Gettysburg, they bring in re-enactors because that’s the only way a thing like that could be assembled. But sometimes there’ll be a situation where a cannon is needed and we will produce that cannon for them. Sometimes then they’ll go ahead and make fiberglass spin-offs from that to make that one into a row — as has happened in a couple of movies. We’re doing some work right now for the State of Delaware. We’ve just finished an 1860 vintage cook stove, an enormous thing; it weighs about a half ton. It was on the Cairo when the Cairo was sunk at Vicksburg, and was used to feed the ship’s crew of a hundred and seventy men. We’ve produced three of those stoves in the last twenty years. We’ve got the third one now ready to send out; we proofed it with three turkey breasts, two hams and a big pot of baked beans! We get into all sorts of interesting projects. PB: I suppose both! If they know about us through one aspect of the business, they probably know about us from the other side, too. BD: Do you like the fact that your fame is spreading all over the world? PB: I suppose! [Laughs] We’ve had some tremendously interesting times. When Henry Mancini is handing you the mustard at a tailgate barbecue, that’s a memorable experience! BD: You’ve got the one recording out from the Tchaikowsky Gala conducted by Temerkanov. Are there other recordings that utilize your instruments and mechanism? PB: Not that I’m aware of, no. We’ve heard a couple of times that a program from a particular place has been broadcast. And over something like that, maybe I’ll get a phone call from a guy in Louisiana or a postcard like the one that arrived from Belgium! BD: Do you know of anyone else who is trying to do the same kind of thing? PB: We hear about it from time to time, but I’ve been doing it since 1967 and I think that’s pretty good durability. BD: I hope you continue for a long time. This interview was recorded in Chicago on November 20, 1999. Portions were used (along with recordings) on WNIB in 2001. The transcription was made and posted on this website in 2009.